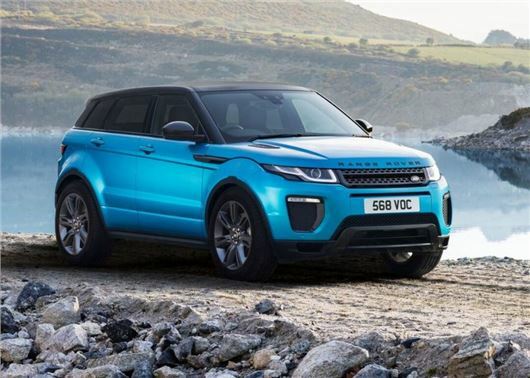 Land Rover is celebrating the fact it has built 600,000 Range Rover Evoques with a limited Landmark edition. Available to order now, the 4x4 SUV goes on sale on 10 May and is priced from £39,000. All versions get a bulbous bodykit, with larger bumpers and wheel arches. There are also grey bodywork highlights and 19-inch dark gloss alloy wheels. The exterior lettering also gets a special Graphite Atlas finish. Inside there are more dashes of grey, with grey leather seats with contrasting Light Lunar stitching and a perforated mid-section. The dashboard - covered in dark leather - gets grey accents and a brushed satin centre console trim. All versions get a panoramic roof, keyless entry and a powered tailgate that can be operated with a foot gesture. The Landmark edition is available with Land Rover’s latest tech, including optional 10-inch touchscreen infotainment and 4G Wi-Fi. The optional Remote Premium app, for a smartphone, lets the owner check the fuel level, location and even pre-heat or cool the cabin. Under the bonnet the Evoque Landmark is powered by a 2.0-litre TD4 diesel with 180PS and a six-speed manual gearbox. A nine-speed automatic will be available as an option and claimed economy will be 58.8mpg for the manual and 57.9mpg for the auto. According to Land Rover, more than 600,000 Evoques have been built since its launch in 2011 with one rolling off the Halewood production line every 170 seconds. More than three quarters are exported, to 130 countries worldwide.